The Jura. One of my favorite areas of wine production in France. Just head West towards Switzerland from Northern Burgundy and you’ll get there. Exciting reds made from the Poulsard grape and zingy whites made from the Savagnin, and you’ll also find the classics – Pinot Noir and Chardonnay, the grape tasted here. 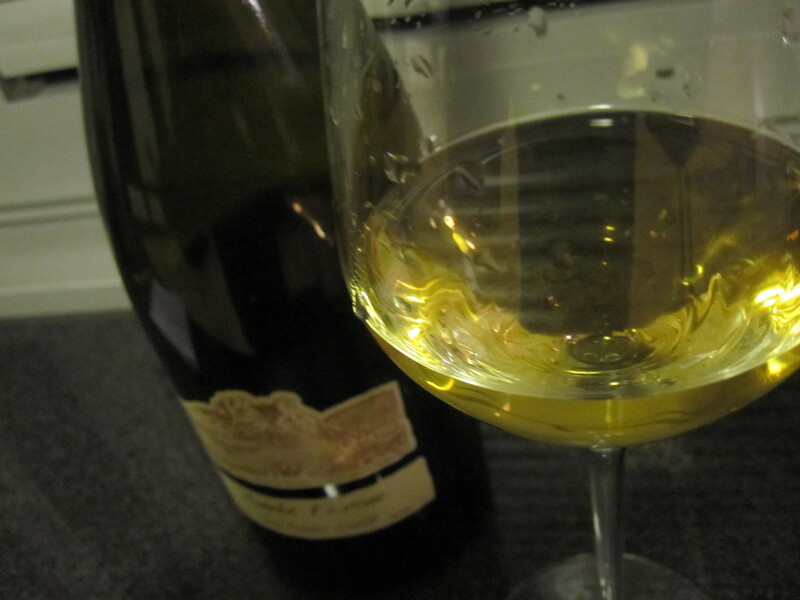 Except, this is not the same “Chardonnay” you find in Burgundy. 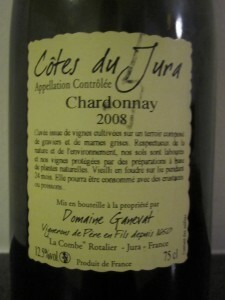 Rather, a Jura-type Chardonnay which gives smaller yields. You can read more about Biodynamic producer Ganevat from this very informative post. Nose: “Orangina” (orange soda – very strange), minerals. 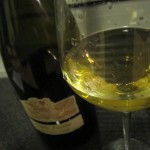 Not a very open and giving wine right away – especially following the Pierre Frick Cremant. More the silent, elegant type. Restrained. 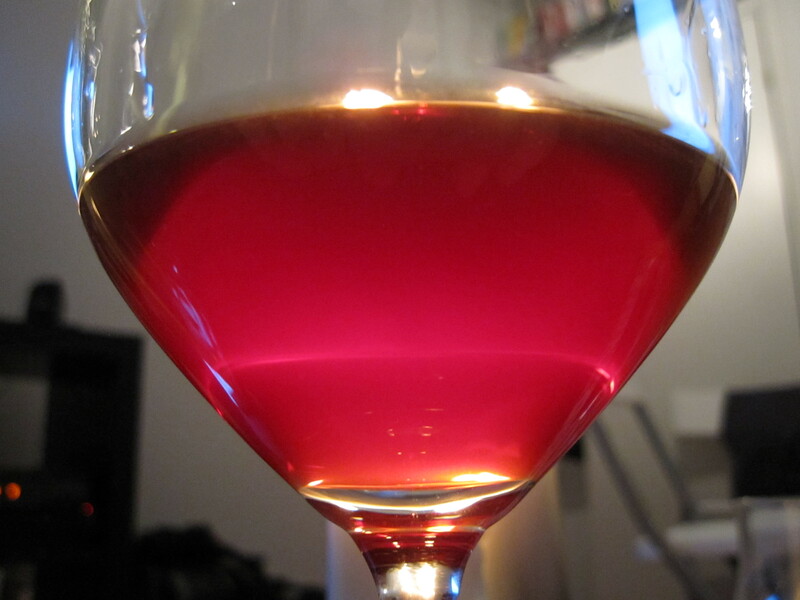 Palate: Extremely vinous, as vinous as a wine can get without adding something to get it that way. It spent 24 months in 500 liter barrels with the lees. Could lend to the vinousity. A very well integrated 12,5% alcohol – barely felt it. Not a very complex wine and not a very long finish. 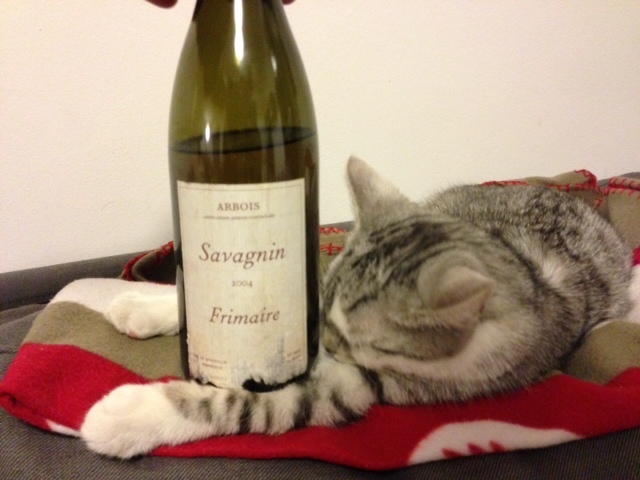 The best this wine offers is it’s concentration and texture. A little too “buttery” and rich for my palate, but the structure, concentration and vinousity of this wine are major pluses. I think that many would enjoy this wine because of the mouth feel. A great wine, but not a wine I would search out for myself. However, it might be interesting to taste an older vintage. Anyone? 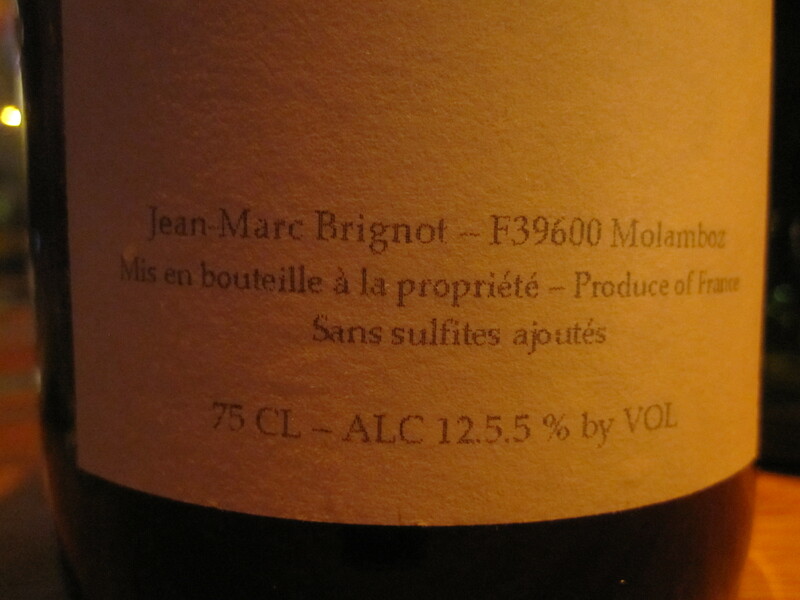 Jean-Marc Brignot is not a new name to me. I have met him on a couple occasions and I have tasted his wines numerous times. I have also mentioned him here a few times. If I was asked to name one of my favorite wine makers, I wouldn’t hesitate. The wine that I am writing about here even landed on my top 9 list after only tasting it twice. And now, thanks to Thomas and Synnøve, I had the chance to taste one of my all-time favorites. 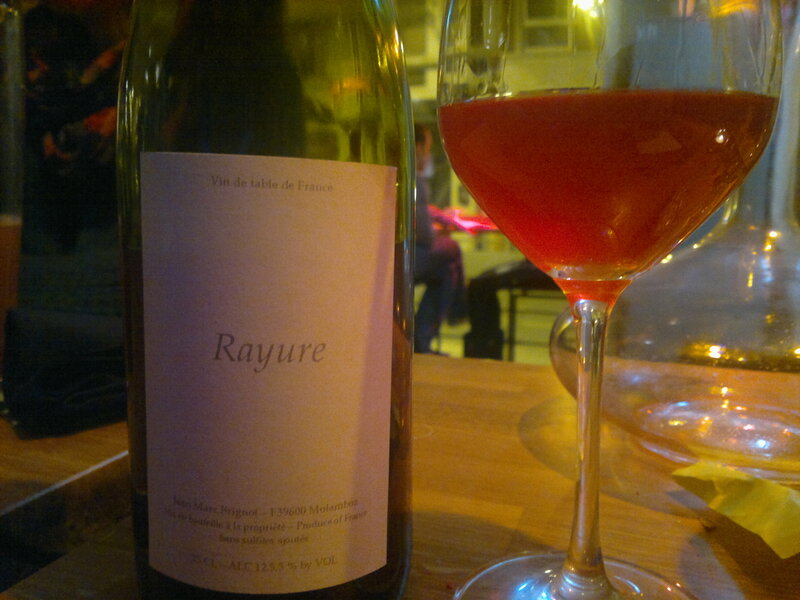 The Rayure… a legendary wine in the natural wine world. One thing we all agreed on (since the 6 of us had tasted this wine more than once, in fact, I was the “virgin” in the group having only tasted it two times before), was that this was a “good” bottle and drinking beautifully. Appearance: wow… what can i say? Red, white and something in between. Nose: What can I say?! The sort of aromas that not only jump out of the glass, but never fail to make me jump out of my seat with excitement! Aromas that can only come from the very best spontaneously fermented grapes.. It’s a smell that a group of friends and I have always called that “sponty smell”. 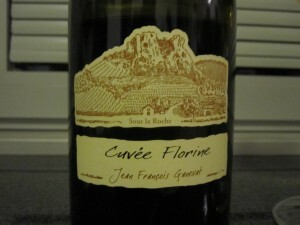 This wine had it, and I love it..Very high intensity, even though slightly reductive at first. 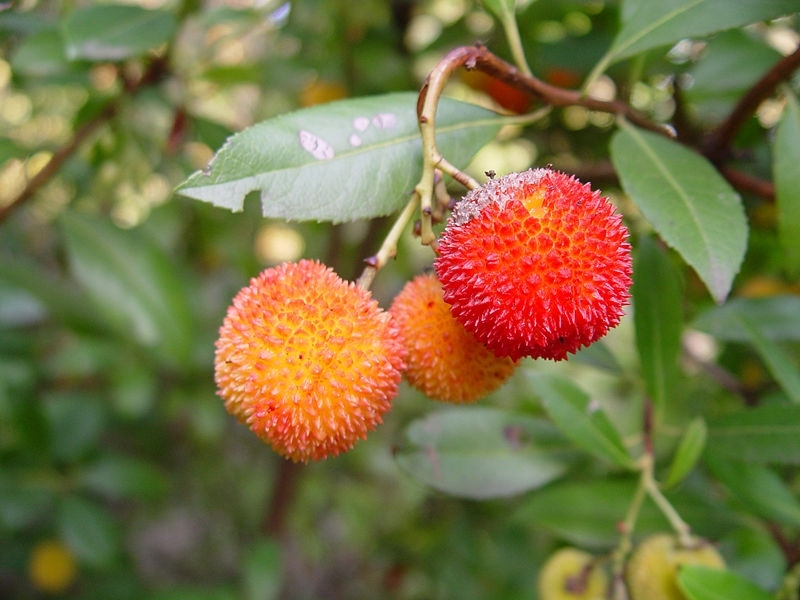 Pink grapefruit, sweet tomato juice (clear), slightly spicy, arbutus fruit (see photo), blood orange (and peel), brie de meux. Now to get my hands on another bottle…hmmmm..
Wanna read more about the Jura, Molamboz and Jean-Marc Brignot? And if my words aren’t enough, here is a short video I shot of Patrick Desplats as he tastes the wine! The video is in English and in French. Even if you don’t understand French, his expressions say it all! Patrick Desplats of Domaine Griottes from vinosseur on Vimeo. 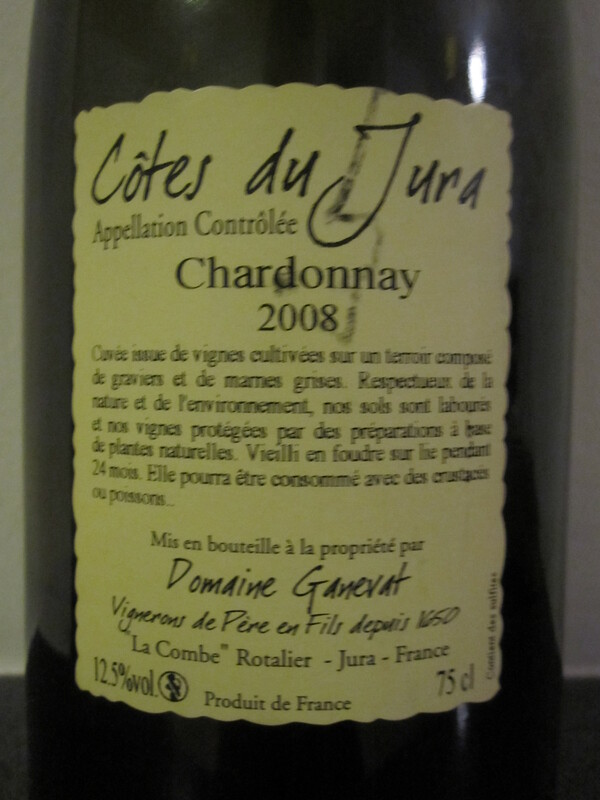 Located East of Burgundy approaching Switzerland, the Jura is perhaps more “known” for it’s white wines made with the Chardonnay and Savagnin grapes. For example, the slightly oxidized, “flor-enhanced” Vin Jaune. 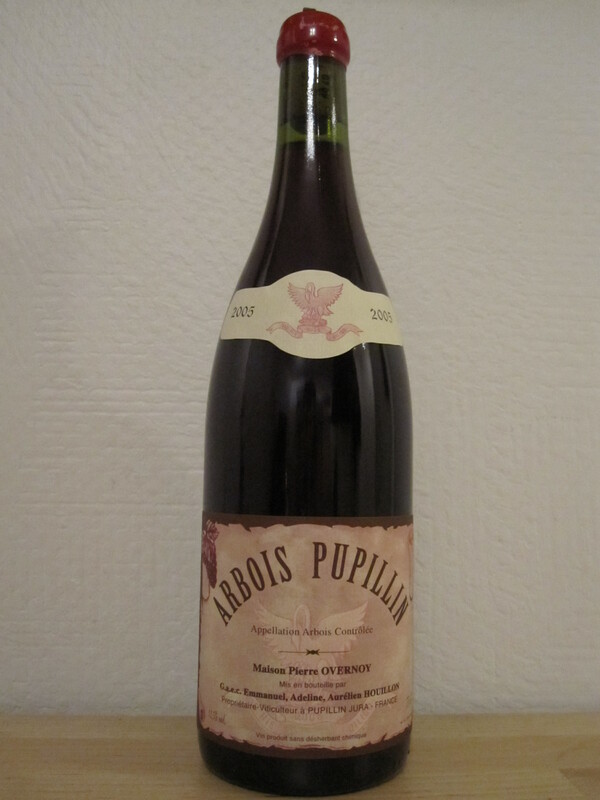 However the “reds” made with the Poulsard grape (as found in this bottle), are perhaps more interesting.. At least to me..
After Pierre Overnoy retired, the Houillon family took over the domain. They have continued in the same manner as Overnoy (from what I understand). 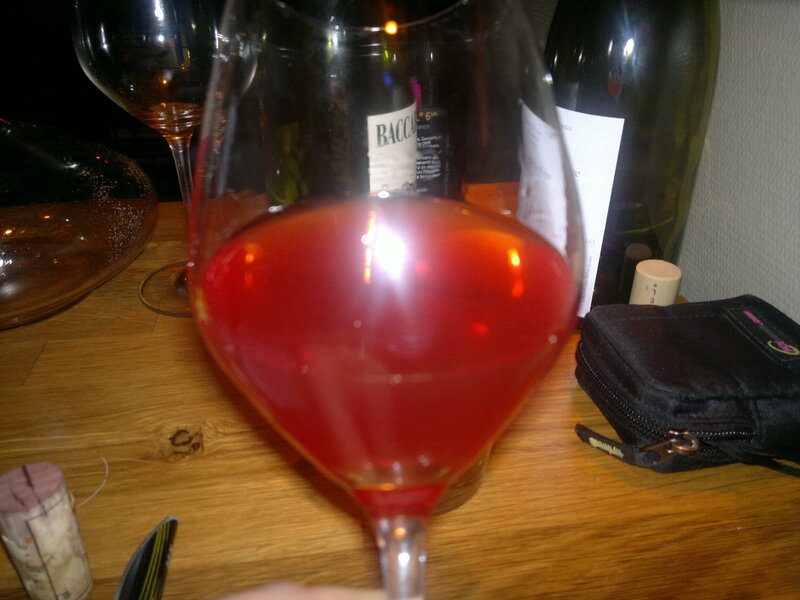 That is, as close to natural viticulture as possible and the same goes for the wine making. No added anything here, not even my least favorite friend, Sulfur Dioxide. 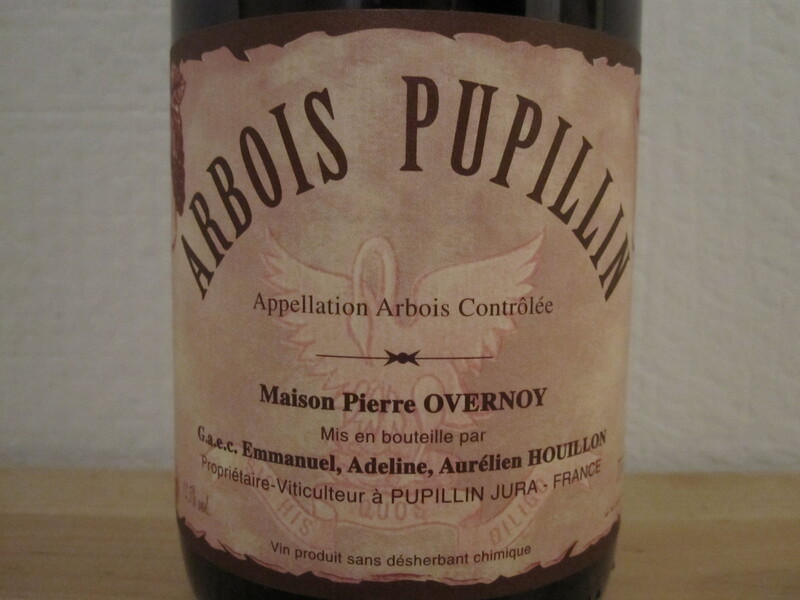 I have tasted both the reds and the whites of Overnoy and I have to say they are amongst my favorite wines… of all time, placing comfortably in my top 9 list (coming soon!) of all time favorites. 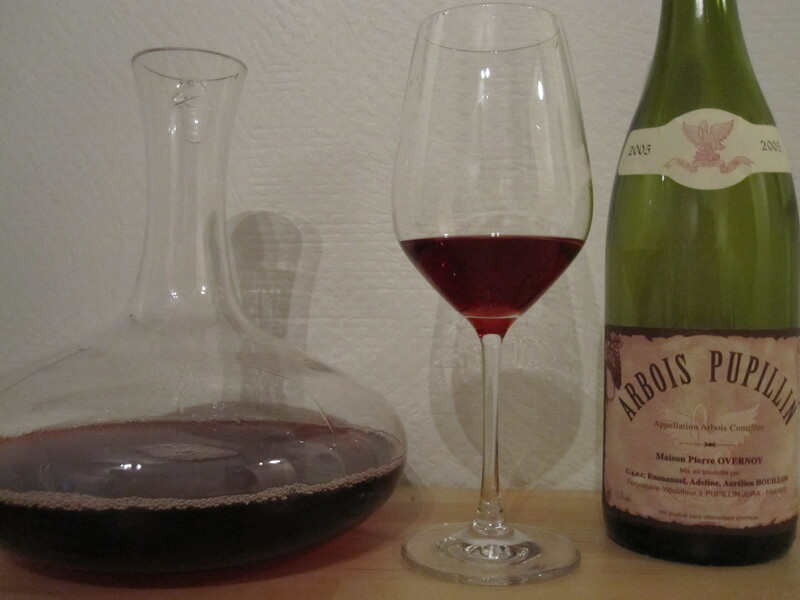 For many years, the only wines of the Jura I had tasted had been those of Tissot. Although the wines of Tissot are good, they don’t approach the quality of Overnoy’s wines in my opinion. Tissot’s wines can seem a bit “dirty” by comparison (again, my opinion). When I first opened this wine – it was exactly as I remembered it and expected it to be. 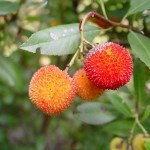 A gorgeous, light red color not unlike what fresh squeezed raspberries or cranberries might look like. In fact, the similarities don’t stop here. The nose was of pure, fresh raspberries and cranberries with delicate spices. Background aromas of cherries, stems and pits. 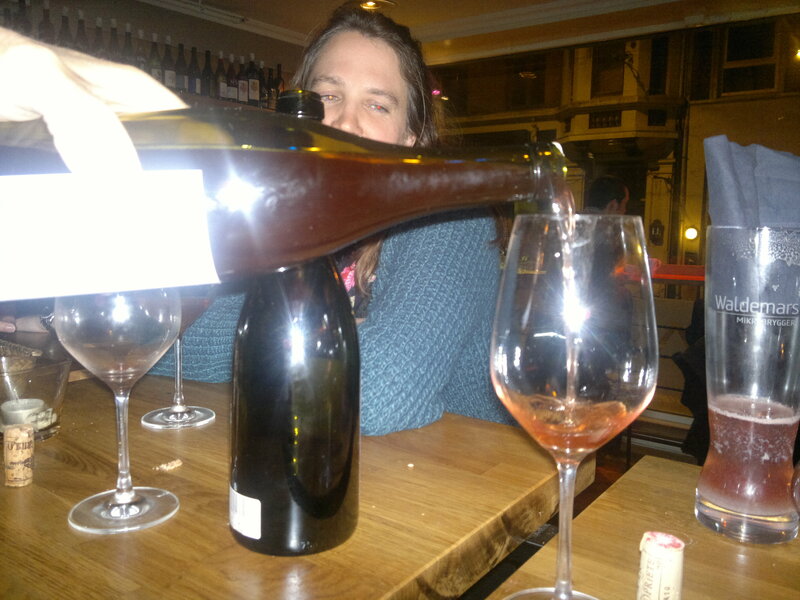 It had that typical “sponty” (spontaneous) nose and was slightly volatile , in that way that we natural wine lovers really appreciate, helping those aromas float up to our noses. Slight animal and mineral tones also noted on the very back. The same was found on the palate. This wine was very alive and it was making me jump out of my chair with every smell and with every taste. BUT, within a little over an hour, my friend and I were looking at each other and asking “huh??”. What the hell happened! The wine was almost completely dead. I don’t normally decant a wine like this. So why the hell did I do it tonight? Was that the problem? First of all, I will never decant this wine again, just in case. 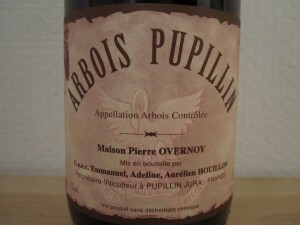 Second, I will continue to drink the wines of Overnoy because they are so incredibly seductive. Finally, in the future I won’t take an hour to drink a bottle of Overnoy again! Oh, I should mention that I had only brought the wine back with me from France two weeks prior – travel sickness? ?